Halal Research Council is looking forward positive responses from companies and potential strategic partners interested in the opportunities of growing awareness of the Halal food Industry. The MOU will establish a strategic partnership to facilitate bilateral opportunities between Halal Research council and other parties in that case to provide Certification Services, Awareness on Halal food, supply chain management, research and development in their respective countries. Focus on Halal Food is indeed timely, particularly the main focus on Halal industry or its product which is giving emphasis on cross border partnerships in all over the world. It is the trend that discussions on Halal products tend to focus Halal food being the most obvious and perhaps the top priority of the listed consumer requirements. Strategic collaboration will ensure better quality control for the global Halal food industry through quality Halal Food Certification, Standardization and Research. 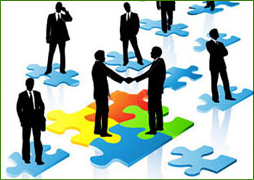 Well reputed organizations, having experience in sectors like Consultancy, Research, Meat & Poultry, Food Manufacturing, Food Retailing, Restaurant Chains, Islamic Banking & Finance, Standards, Certification agencies, Training and Educational Institutes to introduce and promote our quality services in their Countries/Regions as the strategic partners while sharing the financial benefits with each other. If you become a Strategic Partner of Halal Research Council then you can enjoy the financial benefits through Halal Food Certification & Research assignments, free participation in Halal workshops and international conferences. Always on the cutting edge, we work closely with our partners to support and implement new concepts of Halal Industry.